I could open my Week 2 diary entry with something along the lines of 'Your first week is in the books. I knew you could do it' or 'Consider this Japanese proverb - Fall 7 times and stand up 8'. These are direct quotes from the Jawbone and Couch to 5K apps. Instead, I'll pat myself on the back and keep going. Now, to business. I've been wearing the Jawbone UP Move almost every day for three weeks now (no need to worry about battery, it lasts six months). And I'm quite getting into the Jawbone app. I've started tracking my moods with the big emoticon style options. Logging my Couch to 5K runs as activities and taking note of the Smart Coach cards. Like one that told me I had a total of 3 hours 20 minutes of moderate activity in the past week, more than the 2.5 hours experts recommend. It's always good to be above average. I've found that wearing the UP Move has made me more conscious of moving more on non-run days too. 10,000 steps per day isn't always happening at the moment so I felt better after reading Dan Sung's great feature on how to lose weight with wearable tech. He spoke to Ultimate Performance personal trainer Jonny Rees who said 5000 steps will make a difference. So my new weekly goal is 5000 steps a day minimum with my three Couch to 5K runs on top. On the day that I only did 3,700 steps (shame on me) the UP app gave me the Japanese proverb I just quoted to get me going. This being Week 2, I've started Week 2 of the Couch to 5K training app after three honestly fairly easy runs in which I never had to jog for more than one minute at a time. If you're struggling with this first week, you can repeat the workouts so I'd say go for one more week on Week 1. Or just do what I'm doing and see what happens in Week 2. Now, the session is divided into intervals of one and a half minutes of jogging and two minutes or walking. Last week, even though the walking bits were nice breaks I always felt that I could continue jogging so it's more fun to keep going for a bit longer. I'm still nowhere near fit yet - I'm closer to one of the overweight huffers and puffers Haruki Murakami catalogues in his book on running. But the combination of my Jawbone graphs, the coloured dots marking my Couch to 5K progress and the fact I haven't collapsed in the park yet are all positive signs. I achieve almost nothing without a deadline or a to-do list tick box so it's satisfying to see I've already completed four out of 27 Couch to 5K sessions. Plus two of my three runs this week were night runs which I'm getting into mainly because the sun goes down so early. Luckily with only one morning of rain this week in London, I've yet to face going out to run in truly horrendous weather. The lack of running pace from GPS on my first run was thankfully an anomaly, it has since been appearing in the app. I'm not particularly proud of it but in the interests of transparency, I've been sprinting along at about eight minutes per kilometre. Woosh, I know. I'm fairly sure my walking speed is not that much slower and the app confirms this. And as a result, I've still not made it over the 4km distance mark in my 30 minute sessions. Still, considering the stopping and starting nature of the training and the fact I'm in this for a) the routine and b) the distance, I'm not too concerned for now. Honest. It's only Week 2. All I have to do is channel Mo Farah or something. 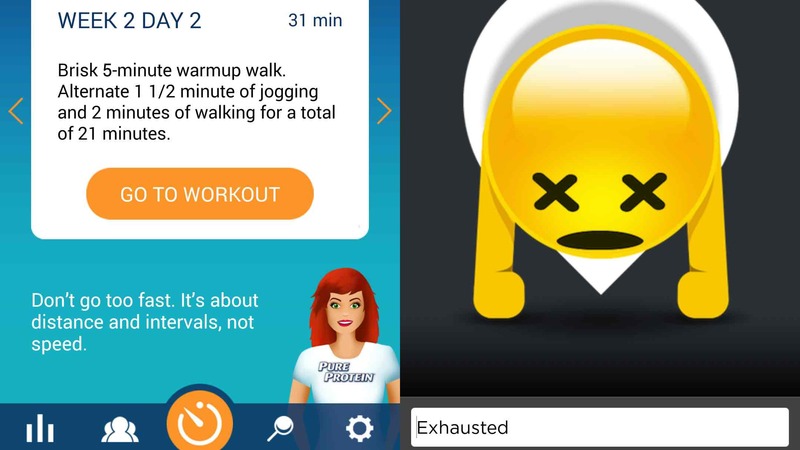 Even the Couch to 5K app's cartoon coach says 'Don't go too fast. It's about distance and intervals, not speed'. The expert advice coming at me from all sides, though, is to get a heart rate monitor involved straightaway. Both our resident fitness expert Kieran Alger and helpful Wareable reader maciejtarnowski say beginners should focus on running by heart rate zones, not pace. So while I'll continue wearing the UP Move to keep me moving every day, by next week I'll be a new runner, turned pro with heart rate monitoring on my side for Week 3 of the challenge. I'll try out a few as, while I'm excited about HRM in earphones like the Jabra Sport Pulse and running watches, Kieran is on the wary side when it comes to the accuracy of anything but straps. So it seems is Garmin which is sticking to straps bundled with its new watches now. Over the next few weeks, I'll try out watches, straps and earphones to see what suits me best. I've been abandoned somewhat by my colleagues here at Wareable - editors Paul and James have been partying, I mean pounding the show halls of CES, all week. So, as ever, any wearable tech and running tips, tricks, words of encouragement, snarky opinions or tales of your own Couch to 5K training are very welcome in the comments below.